A tiny home does not mean giving up dreams – it simply means making dreams mobile. 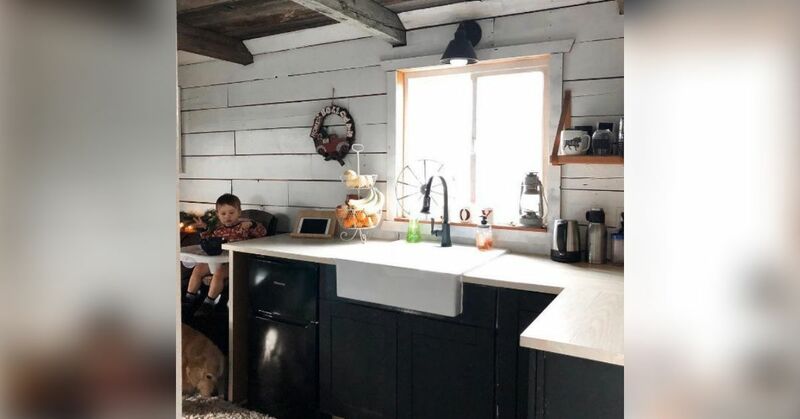 This tiny farm-on-wheels has all the luxuries of a regular house, yet the owners have the freedom to take their farm wherever they go and eliminate a mortgage. The Wilkinsons sold their traditional home more than a year ago while the housing market was high. Choosing to live with family while they built their dream home, they dove into construction, building only on the weekends. About eight months later, they were living in their tiny home. What makes this tiny home so special? It lets the owners have a tiny farm without a mortgage. Better yet, if they move they can take their home with them. The kitchen features a full-sized gas stove with four burners. The counter space on either side gives the cook a convenient place to set things while fixing meals. Many people think tiny living means sacrificing counter space, but this kitchen has an L-shaped counter in the kitchen, maximizing workspace. The natural wood ceiling and white walls create a feeling of openness. The family room continues with the white walls and natural wood ceiling. A wood-burning stove heats the space and creates a "homey" feeling. The tiny farm comes with its own laundry room made out of the hall between the kitchen and the bedroom. The stackable washer and dryer combination let the owners maximize their space and do their clothes washing at home. The farmhouse has two bedrooms. The owners removed the crib that used to sit against the wall and are transforming the space into a bedroom for their toddler. The orange walls come from reclaimed wood, but the long-term plan includes a new paint job. Many tiny homes have just a stand-up shower, but this tiny home has a full tub and shower – a must with a little one. The other half of the bathroom features counter space and a toilet. Who says you can't have it all with tiny living? This tiny home created by the Wilkinsons might change your mind.